GUANGZHOU, China, April 16, 2019 /PRNewswire/ -- The 125th China Import and Export Fair (Canton Fair or "the Fair") is bringing more than 25,000 exhibitors across 51 product sections from home and abroad to Guangzhou. Covering an area of 1.18 million square meters, this year's fair will see a 30% increase in the number of updated products, demonstrating original innovation and new opportunities to global businesses. Companies from countries along China's Belt and Road Initiative (BRI) will showcase their latest products in the International Pavilion. 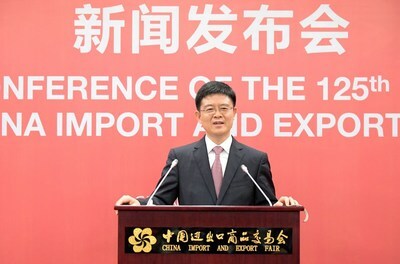 "The Canton Fair is welcoming more companies with intellectual property protection, private brands and marketing capabilities that demonstrate high-tech and value-added products," said Xu Bing, Spokesperson of the Canton Fair and Deputy Director General of China Foreign Trade Centre. The 2019 Canton Fair International Market Forum, with a focus on promoting China and Russia's strategic partners on the 70th anniversary of diplomatic relations between the two nations, will promote the consolidation of Sino-Russian economic and trade cooperation. Global Cooperation Networking for International Pavilion will highlight the opportunities that Canton Fair brings to the Greater Bay Area as a trade platform, encouraging business participation and resource exchange between domestic and international companies. Canton Fair's efforts to promote sustainable development also include poverty alleviation for domestic businesses. More than 700 companies from less-developed areas have been given free exhibition space and included in themed promotion events, introducing local specials to the international market and creating new market options to global buyers. The China Import and Export Fair, also known as the Canton Fair, is held biannually in Guangzhou every spring and fall. Established in 1957, the fair is now a comprehensive exhibition with the longest history, highest level, largest scale and largest number of products as well as the broadest distribution of buyer origins and the highest business turnover in China.